Over the past few years, many states have faced critical choices about whether to raise state revenues, hold firm to existing—potentially inadequate—tax structures, or cut taxes, sometimes on top of cuts made in earlier years. Today, lawmakers in Pennsylvania are again considering these same choices, but with a somewhat unique opportunity to change course from the path they took earlier in the recovery. Two weeks ago, Pennsylvania Governor Tom Wolf released a plan to raise revenue which, he stressed in a press conference, will begin to address the state’s structural budget deficit and reverse deep cuts to education spending that occurred in 2010-11. As lawmakers throughout the country consider plans for the coming fiscal year, it is instructive to compare the fiscal and economic performance of Pennsylvania in recent years with other states that made either similar or starkly different fiscal choices. For example, California and Minnesota raised taxes to improve their fiscal health and to reinvest in education, while Kansas and Wisconsin followed the same path as Pennsylvania—reducing taxes by varying degrees and dramatically cutting education spending. The two states that raised revenues have enjoyed percent job growth since 2010-11 that is one-and-a-half to three times larger than the three states that cut taxes. The states that increased taxes have seen revenue growth—both as a result of the tax changes and as a result of stronger recoveries—of 8 percent and 15 percent. Kansas has seen its revenues fall 5 percent and Pennsylvania and Wisconsin have seen revenue growth of 5 percent and 7 percent, meager enough to make fiscal stability and reinvestment in vital programs difficult. State school funding per pupil has increased 15-21 percent in Minnesota and California while plunging 9-14 percent in the three tax-cut states. That means the ratio of funding per pupil in Minnesota and California compared to any of the other three states has shifted 26-41 percent in just four years. The Pennsylvania Budget and Policy Center has spent a lot of time recently analyzing the impact of Pennsylvania revenue and budget choices since 2011. With Pennsylvania lawmakers now facing a critical new “test vote” on their willingness to raise revenues, we decided it would be helpful to examine the experience of some other states that recently made similarly difficult choices. In the following fiscal year, Minnesota generated about $1.4 billion in new revenue through a package of sales, personal income, corporate income and cigarette tax increases (equivalent to raising $2.1 billion in new revenue in Pennsylvania). Also that year Wisconsin reduced its personal income tax rate, lowering tax revenues in 2013-14 by $319 million (the equivalent of a $650 million dollar cut in Pennsylvania). Judging from the rhetoric of advocates for no new taxes, you would predict that Kansas and Wisconsin boomed, bringing in new jobs and new tax revenue after lowering taxes. You would also expect California and Minnesota to see their recoveries stall as they raised taxes and drove away business. The chart below shows growth in tax revenue in each state3 from 2010-11 to 2014-15, the growth in per-pupil state aid to school districts4 over the same period, and finally, job growth5 from January 2011 to this August. Note: The growth in tax revenue and per pupil state aid to schools is measured from 2010-11 to 2014-15. Job growth is measured from January 2011 to August 2015. California and Minnesota saw more revenue growth, partly because of their tax changes but also because of faster economic growth.6 These two states also saw more job growth over this period than either Kansas or Wisconsin. 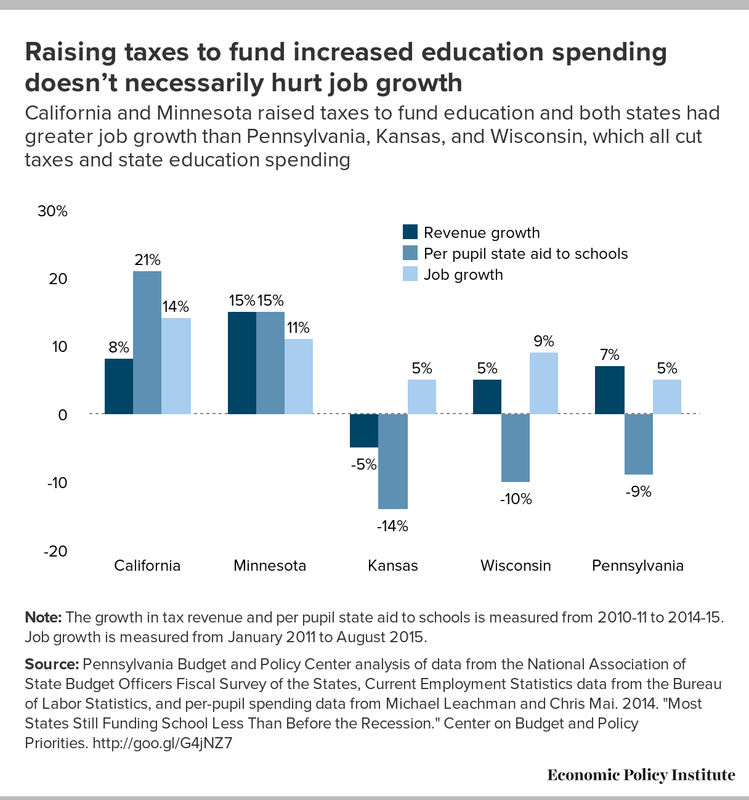 And of critical importance to the debate in Harrisburg, these states didn’t raise taxes for the sake of raising taxes: they raised them to get their fiscal houses in order while also boosting education spending. It’s also worth pausing for a second to process how large the changes in per-pupil state education funding were between the two “raise revenue” states and the three “cut taxes/no new taxes” states. If all five states had started out with equal state per-pupil spending in 2010-11 (just to make the numbers simpler to follow), by 2014-15 (i.e., four years later), California and Minnesota would have state per-pupil spending levels 26–41 percent higher than each of the three other states. Surveys of school districts by the PA Association of School Business Officials and PA Superintendents’ Association (e.g, in May 2012 and June 2015) document the impact that Pennsylvania’s smaller changes in funding levels have had on class size, and whether districts offer full-day kindergarten, tutoring, art, music and other educational programs that improve performance. Given that, it seems safe to assume that the 26–41 percent shift in relative state funding per student means that students in fifth grade today in California and Minnesota will have a better chance in life today than students in fifth grade now in Pennsylvania, Wisconsin, and Kansas. In fact, an updated review of the literature supports this conclusion. What should states learn from this? The two states that raised taxes after 2010-11 enjoyed robust job growth and were able to invest substantially more in education, thereby strengthening the prospects for their state’s future workforce. The three states that cut taxes demonstrated no particular advantage in economic performance. Rather, they had meager job growth and, at the same time, saw their education funding levels plummet. Five years from now, when we look back to the budget decisions being made right now, what will be the course that lawmakers in Harrisburg, and in statehouses throughout the country, took in 2015 and 2016? Will it be remembered as the moment when lawmakers across the country began governing based on the lessons of Pennsylvania’s and other states’ experience, the moment that lawmakers’ of both parties made common cause to raise revenues essential to fixing state finances and giving all kids a chance? Or will it be remembered as the time when the prospects of children in different states began to dramatically diverge, with children in states with underfunded education systems having little chance of competing with peers from better-funded states? Will Pennsylvania lawmakers and those of other states again reject common sense and doom their states’ children to more years of disinvestment from our schools? 2. The National Association of State Budget Officers reported tax cuts in Kansas would reduce revenues in 2012-13 by $231 million, since the cuts took effect in Jan 2013 midway through the fiscal year this understates the scale of the cuts enacted in in 2012-13. Michael Leachman and Chris Mai. 2014. “Lessons for Other States from Kansas’ Massive Tax Cuts” Center on Budget and Policy Priorities (http://goo.gl/FMimm5) report that the non-partisan Legislative Research Department in Kansas estimates the revenue impact of the 2012-13 tax cuts in 2013-14 was $803 million or the equivalent of well over 3 billion in tax cuts in Pennsylvania. 6. Real GDP in California and Minnesota grew 9.1% and 7% respectively from 2010 to 2014. Over the same period real GDP grew by 5.5% in Kansas, 6.4% in Wisconsin and 5.2% in Pennsylvania. 7. Pennsylvania’s revenue growth, while less than half that in Minnesota and California, was much greater than (the revenue decline in) Kansas and a bit larger than revenue growth in Wisconsin. That’s likely because Pennsylvania’s revenue policies were less extreme than those in Kansas. It’s also because we start our period in 2010-11 and Pennsylvania through some point in late 2011 continued to benefit from a robust economic recovery under the policies of the Rendell administration.